Geotextiles are used in the construction of pavements, roads and permeable paving installation to separate different layers of angular stone, ensuring that the trafficked surface remains stabilised. Used in the construction of driveways, patios, paths, roads, pavements, car parks, soakaways, drainage, porous pavers and filter drains.Geotextiles allow filtration and separation of granular layers by stopping fine particles while allowing water through for drainage. 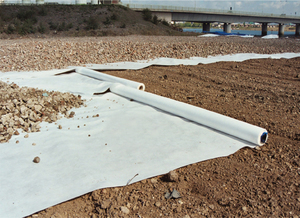 We supply market leading Terram T1000 geotextiles that are manufactured from permeable non-woven needle punch fabrics and are supplied on rolls from 2.25m wide x 100m rolls and up to 4.5m wide in smaller builder packs. 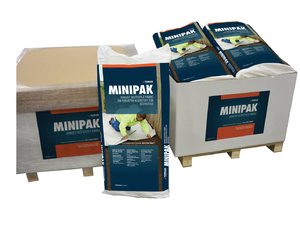 Our larger rolls of Stablemas non-woven getextiles are available on 4.5m x 100m rolls for larger projects.